- Aikido decides life and death in a single strike, so students must carefully follow the instructor's teaching and not compete to see who is the strongest. - Aikido is the way that teaches how one can deal with several enemies. Students must train themselves to be alert not just to the front, but to all sides and the back. - Training should always be conducted in a pleasant and joyful atmosphere. - The instructor teaches only one small aspect of the art. Its versatile applications must be discovered by each student through incessant practice and training. - In daily practice first begin by moving your body and then progress to more intensive practice. Never force anything unnaturally or unreasonably. If this rule is followed, then even elderly people will not hurt themselves and they can train in a pleasant and joyful atmosphere. - The purpose of Aikido is to train mind and body and to produce sincere, earnest people. Since all the techniques are to be transmitted person-to-person, do not randomly reveal them to others, for this might lead to their being used by hoodlums. 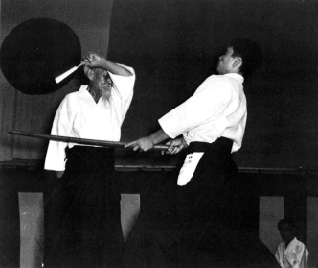 - Proper Aikido can never be mastered unless one strictly follows the instructors teaching. - Aikido as a martial art is perfected by being alert to everything going on around us and leaving no vulnerable opening (suki). - Practice becomes joyful and pleasant once one has trained enough not to be bothered by pain. - Do not be satisfied by what is taught at the dojo. One must constantly digest, experiment and develop what one has learned. - One should never force things unnaturally or unreasonably in practice. One should undertake training suited to his body, physical condition and age. - The aim of Aikido is to develop the truly human self. It should not be used to display ego.